The AdAstrA Research Group, Ltd product line, distributed under TRACE MODE® and T-FACTORY.exe® trademarks, provides real time solution for the whole range of process control and manufacturing business automation issues. 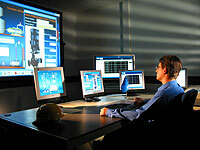 development of reliable HMI applications (SCADA/HMI). Real time HRM – Human resources management. Altogether they provide the comprehensive information platform for control of the modern manufacturing process based on the in real time technologies. The TRACE MODE 6 development tool is free (the basic version) and is available for direct download.